I've created a monster. A cinnamon roll one to be exact. A cinnamon roll one covered in cornflakes and maple mascarpone goodness. It's a wonderfully terrible thing. Or maybe just straight up terrible. I'll let you and your waistline be the judge. Either way, the cinnamon roll cornflake crusted french toast monster exists and must be dealt with. Since I like to deal with things as positively as possible, I'm going to deal with this monster as if it is wonderfully terrible, k? K! So here's the scoop on this monster. You take some cinnamon roll dough (or, if it's fall, and you shop at Trader Joe's [Side note: I don't know if we can be friends if you don't!] 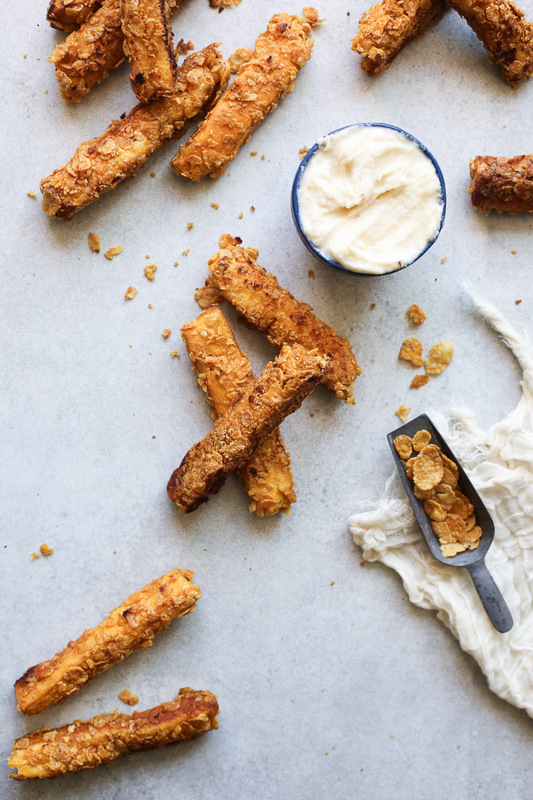 you can also use their pumpkin spice rolls), you bake it in strips, you give the strips a little dip in a milk and egg mixture, you finish them off with some corn flake crunch and then you fry them up in butter. Oh yeah, and then you proceed to eat them all because they're so darn good you can't just stop at one...or two...or five. A monster, I tell ya...a wonderfully horrible terrible or terribly terrible horrible monster. It should also be noted that I really don't like pre-made, ready-made, semi-made or store bought anything. I like things homemade or I don't like them at all. These use pre-made cinnamon roll dough. I like these...a lot. If that doesn't tell you how good these cinnamon roll French toast sticks are, I don't know what will! Also.....I'm sorry in advance for the monster I have created. P.S. 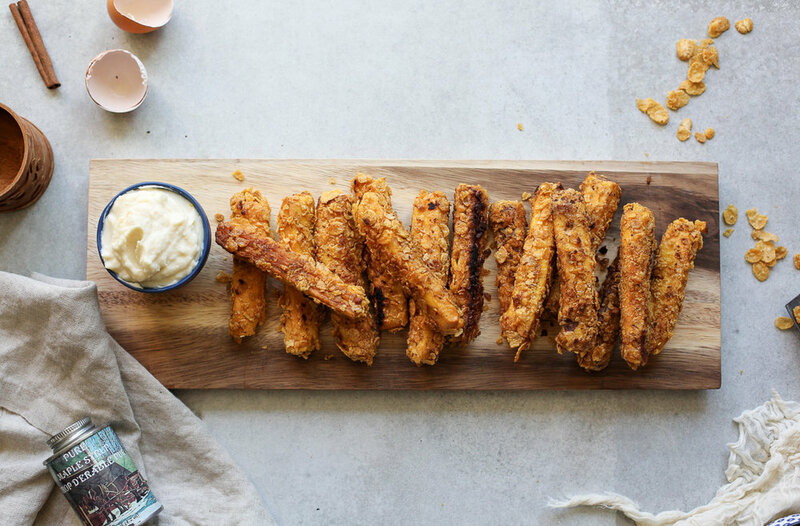 While these would be great for any breakfast or brunch situation, they're a perfect finger food so I would highly recommend them for brunch parties. Also, they can be made ahead of time then reheated in just a few minutes in the oven and they come out tasting like you just made them! See, not all monsters are bad! Preheat oven to 350 degrees. 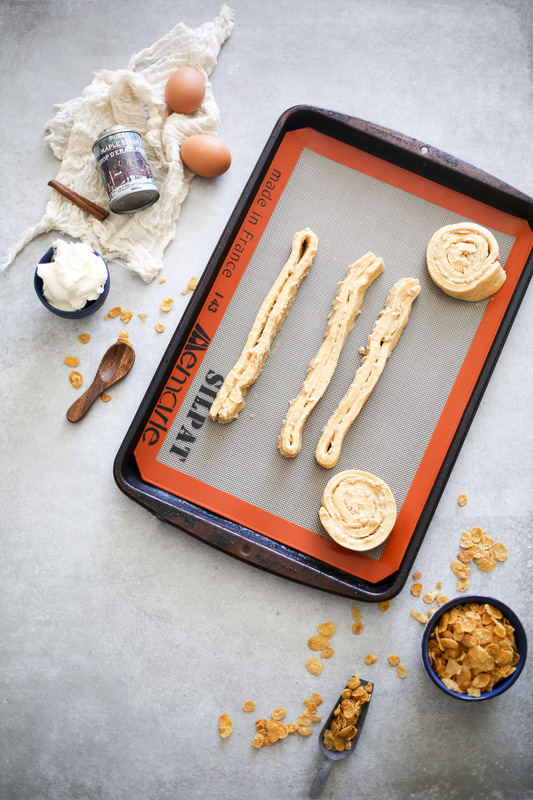 Line a baking sheet with parchment paper or a silpat mat and set aside. Unravel each cinnamon roll. Then fold each strip of dough in half, lightly pinch it together and place it on the baking sheet, spacing each strip about an inch apart. Bake for 15-18 minutes or just until the dough starts to brown. Do not over-bake! While you allow the cinnamon roll sticks to cool slightly, in a medium-sized bowl, beat the eggs, milk, cinnamon, vanilla and pinch of salt until well combined. Set aside. Also, add your cornflakes to a shallow dish and set that aside, as well. Cut the cinnamon roll sticks to the size you desire. I split mine lengthwise then in half. Place a medium-sized skillet on a medium heat burner. Add a small pat of butter and allow it to melt and heat up. Meanwhile, start dipping the cinnamon roll sticks first in the egg mixture, then in the cornflake mixture. You made need to use your hands to press the cornflakes on a bit and ensure that they stick. Place them in a single layer in the skillet and cook, flipping every few minutes, until golden brown. Serve right away, or, place them on a baking sheet in a 225 degree oven to keep them warm until you're ready to eat them. 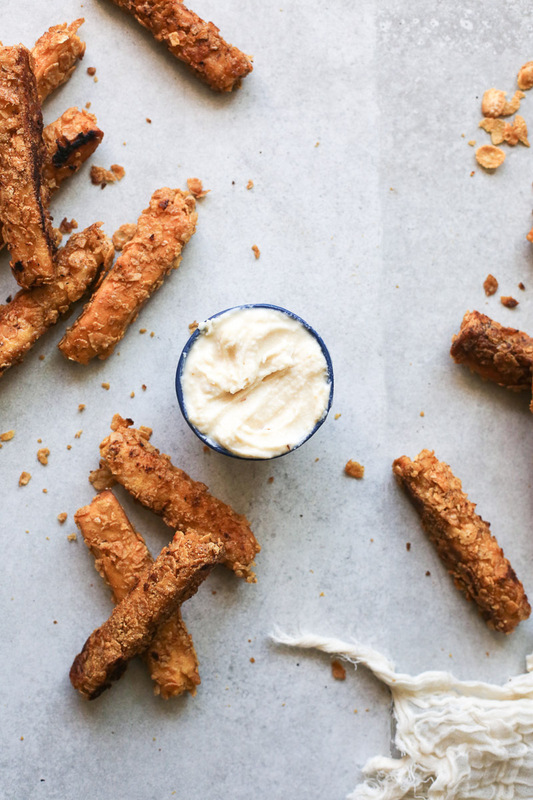 Continue on until all the french toast sticks have been cooked (Do note- You will need to add a little butter in with each new batch of sticks to make sure they don't burn. Additionally, make sure to scrape out the pan of any extra cornflakes between each batch as they burn easily and can taint the flavor of the french toast sticks that you're cooking). To make the mascarpone dipping sauce, simply stir together the mascarpone, milk (or cream) and maple syrup just until smooth. 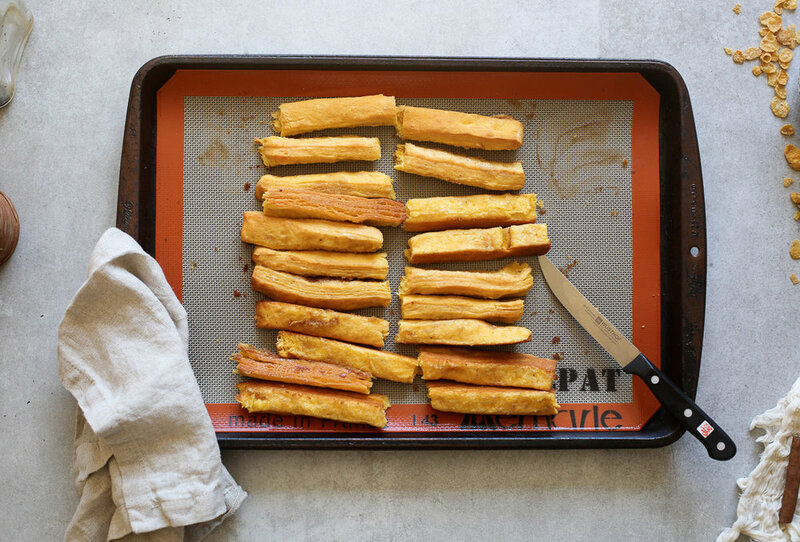 Store any leftover french toast sticks in a ziplock bag or airtight container. To reheat them, simply place them in a single layer on a lined baking sheet, pop them into a 350 degree oven for 7-10 minutes and then serve. Store extra mascarpone dipping sauce in an airtight container. Allow to soften to room temperature prior to serving.